President Vasciannie Pays Courtesy Call on Prime Minister — UTech, Ja. Prof. Stephen Vasciannie, CD (left) President, University of Technology, Jamaica in conversation with Prime Minister, the Most Honourable Andrew Holness,ON, MP during a courtesy on the Prime Minister on Tuesday, January 31, 2017 at the Office of the Prime Minister, Kingston. 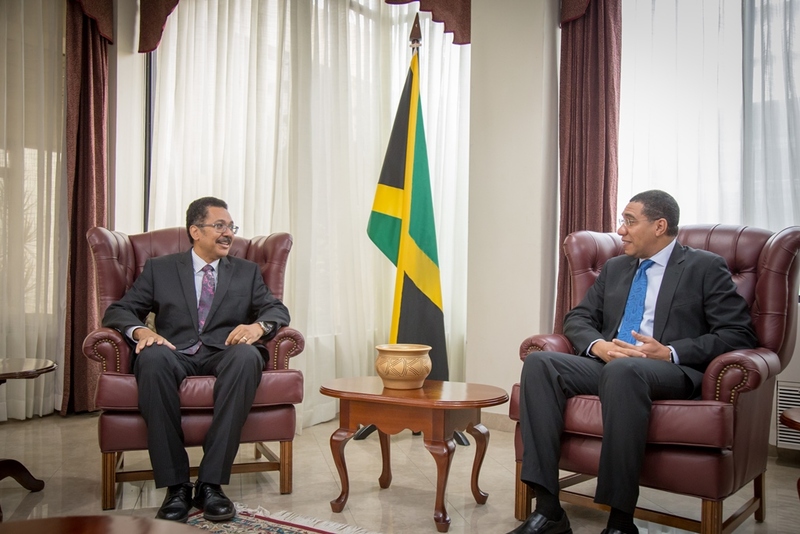 Prof. Vasciannie who took up office as President of UTech, Jamaica on Tuesday, January 3, paid the Courtesy Call on the Prime Minister as part of a series of on boarding activities to introduce him to the University’s internal and external stakeholders in his new capacity as President. Prof. Vasciannie was accompanied by Mr. Richard Powell, Pro-Chancellor and Mr Aldrick McNab, Member of Council, UTech, Jamaica.